So you’re building an app. Have you thought about what you will do when you launch your app? Are you going to make a bang? The unfortunate reality is, most apps don’t ever really take off. Why? Think of your app like a car. A perfectly fine vehicle, providing there’s a driver behind the steering wheel. And providing that the driver actually knows what they’re doing! Launching your application is the same. If you’re not driving that process, or if you don’t know what you’re doing, your chances of making a splash are slim-to-none. I’ll include tools that we’ve used in the past to attain massive media exposure (our apps have been featured on all the major TV channels in Australia and in some of the world’s most influential tech-blogs). When do you start marketing? There is no right or wrong time to start. But I know that if I could have started planning/marketing my business 6 months prior to launch I would have been 6 months ahead by the time we started. It gives you an incredible advantage and allows you to be proactive, rather than reactive. They don’t know where to start. The fact of the matter is, all applications have bugs and no one knows what they’re doing the first time they do it. Don’t let those insignificant issues become an obstacle to your success! How much should you focus on marketing? Most new businesses (and software businesses alike) will focus mostly on Systems and Operations to make sure their app can handle MILLIONS of users at any given time. But if you’re focusing too much on Systems and Operations then you probably won’t need that kind of capacity…because you simply won’t have the users. You need to have a balance. I would even go as far as to say that if you have a business partner (as you should) then one of you need to be dedicated to marketing. At least in the early days. Depending on your business model you should spend at least 10% of your gross annual income on marketing, but anywhere up to 30% of total company time on marketing activities. Preparation is possibly the most important part of launching an app. Without a decent amount of preparation and a solid plan your launch will end up looking like a skirmish of half completed ideas. Claim social media accounts – Facebook, Twitter, Google+, Linkedin, Pinterest, Instagram, etc. Set up a basic website or landing page with a blog to promote your app and encourage sharing, as well as collect emails of people you want to keep in the loop. For a complete checklist of everything you need to get done before you launch, click here. I often hear people say “I don’t want to start drawing attention to my app too early.” Let me tell you a secret: There is no such thing as too early. If you want to get a lot of downloads then you need to attract a lot of traffic. Any app with more than 1 million downloads is worthwhile adding to your list. The idea here is to disseminate where they got their traffic from and copy them. External sources, e.g. Search, Mail, Referrals, Social, Display ads, etc. From this you should be able to gauge where traffic is coming from (on average) and where to spend your time when launching your own application. The majority of traffic will come from external resources. Don’t go jumping into all of these sources, you’ll end up with more than you can handle. Pick the top 2 and focus down so that you can be productive with your time. Search engine traffic will grow over time. It’s not a quick fix so we discount that right away. Instead focus on building social media buzz and getting featured on relevant blogs. That will actually help search engine traffic growth as well. Punching out a good story will massively improve your chances of getting a few write ups. I’ve taken the courtesy of preparing a press release guide that you can follow [Pats on back]. This will guide you through the process of writing a compelling press release. Then all you need is a list of app/tech review companies to contact… oh, don’t worry I have provided that too! Here is my list of the top 100 app/tech review companies. Use it wisely – with great lists comes great responsibility. Going back to your findings on SimilarWeb, list out all the blogs (referral traffic) that have linked to one of the apps you’re watching. Open the web-based App Store/Google Play page of the apps that you’re watching. 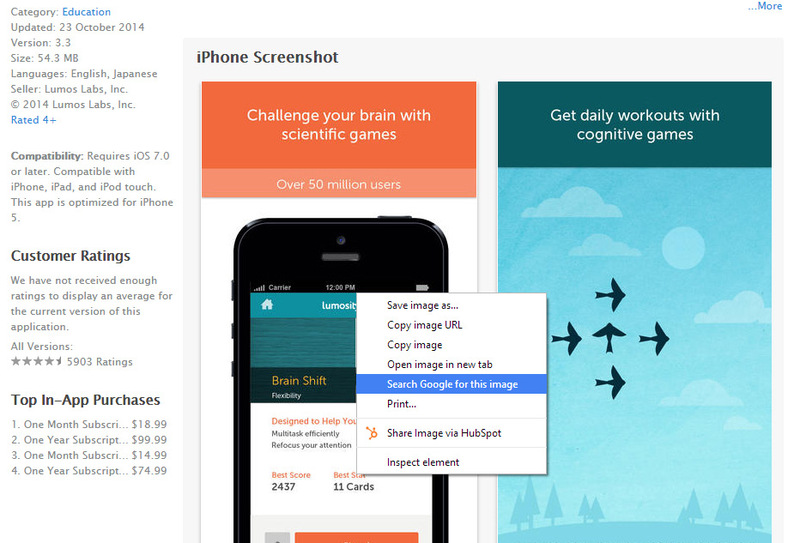 Right click (for PC; or COMMAND+Click for Mac) on one of the screenshot images of the app. If you’re using Google Chrome (as you should be) you’ll get an option to ‘Search Google for this image’. Now you’ll see every website that has ever posted that image. Scroll through the results and find relevant blogs. This also works if you save the image to your desktop and drag them into Google. Relevance – will their readers be interested in your app? Readership – how much traffic does their site get? Use www.alexa.com for quick reference. Connections – do you know anyone who can make an introduction with the site owner? Reach – will they promote you pushing your app out to their email subscriber list, Facebook and Twitter following, etc. Keep a spreadsheet of; publication, URL, name of the author/writer to help you stay organised for the next steps. This spreadsheet is worth its weight in gold if used right because it contains blogs that have a good chance of featuring you and driving much needed traffic. Schmoozing a blogger that you don’t know can be hard. Often they don’t interact or care to speak to you if they don’t know who you are or if you have nothing to give them. I would only recommend this as a fall-back plan if you can’t get an introduction. How do you get an introduction, you ask? Find your bloggers on Facebook and add your mutual friends to your blogger list. You can also use professional social networks like Linkedin. Wait for the response and judge the mutual friends relationship with the blogger accordingly (1 great, 10 weak). Scrap the ones that are a 3 or less. How are you? I’m a big fan of (insert blog name) and wanted to keep you in the loop of what I think could be a really good story for you. Check out a couple of pictures of our new application. If you’re interested please let me know how I can help you make the writing process easier for you. I can send more information. We’re launching on ________________. A thumbs up at this point doesn’t mean that the story is secure. At some point you want to make contact with the blogger over the phone to bond a little bit. Get chummy. “We’re going live on _____________. Can the story be published at that time?” Try to get as close to that day as possible and preferably in the morning on a weekday. Try to get on any other media where they have a strong following; Twitter, Pinterest, Google+, etc. This might seem intrusive or rude but you need to keep in mind that bloggers work hard to get their stories out to as many people as possible. It’s in their interest to time their launch well. Just be polite and explain why timing is important. Your best advertisers are your friends and family. You’ve spent all this time and money working to create something you’re really proud of. They will support you in that. Ask them for their input and advise along the way. Even if you don’t take on all their ideas, they’ll still be engaged and excited to be part of something cool. Throw a launch party. Make it a big deal. Think about it, you’re starting a new business, IT IS A BIG DEAL! Empower your friends to contribute by sharing your vision. Share with them your ‘why‘. Not measuring user engagement and retention – if you don’t keep a keen eye on your metrics then it’s virtually impossible to know what’s working and what isn’t. Take a look at our guide for How To Measure The Success Of A Mobile App as well as How To Gain Actionable Insights From The Top 5 App Metrics for more on this. People don’t know how to sell themselves or their app – the art of writing sales copy and a sales pitch is vital to the success of your launch. You can contact 1000 bloggers with a blunt pitch and land 1 story. Or you can contact 25 bloggers with a razor sharp pitch and land 15 stories. Spend time learning about pitching and copy writing, and make your life easier. Not updating enough – app development is an iterative process of constant improvement. You never know how your users are going to respond to your app until it’s built and they are using it. So it’s important that you take an iterative approach and build on it over time with improvements, bug fixes and new features. Make it easy to download – make a link to your app available for download on ALL your collateral in places that are obvious. Losing momentum – marketing is not a once-off activity. It’s an ongoing effort that requires hard work, focus and excellent execution. Keep the momentum going! Read our detailed marketing guide to learn how to attract (and keep) a steady stream of downloads coming in. Check out 21 Tools For Marketing Your Startup for a detailed list to help you with marketing. Google Docs – for sharing documents with colleagues and keeping tabs on your lists. Dropbox – all your photos and files in one place accessible from all your devices…what more do I have to say? XYO.net – research apps to find out if they get a good amount of downloads. SimilarWeb – drill down to find out where other apps get their traffic from. 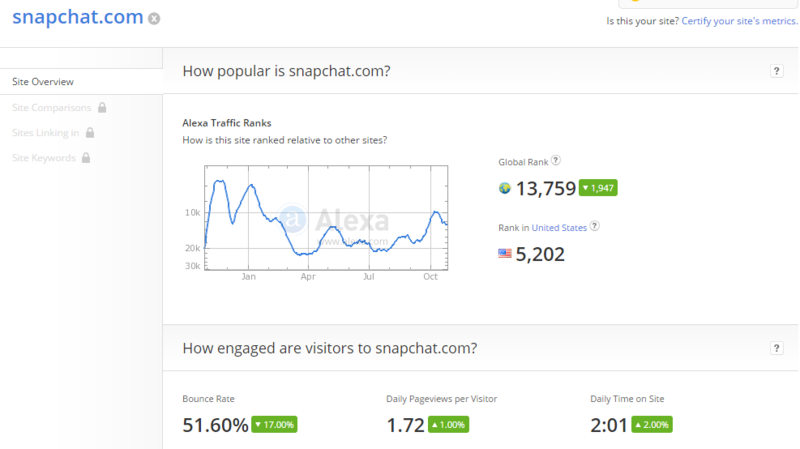 Alexa.com – get an overview of website traffic volume. MailChimp – keep a database of email addresses and stay in touch with your followers through email broadcasts. How else can you reach your audience? Share your best advise, views and thoughts below! Great post! Will definitely leverage some of the tips mentioned in this article in parallel with developing my iOS app TravelR. After launching mobile apps it is difficult for marketers to increase the number of downloads. I hope by following your tips they can easily easily maximize their app downloads .